Athena Cat Goddess Wise Kitty: Thank You Lone Star Cats for this Lovely Award! Thank You Lone Star Cats for this Lovely Award! 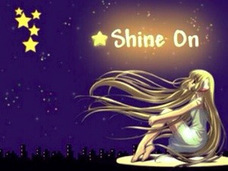 Thank you, Lone Star Cats for nominating me for the Shine On award. Here are 7 Random Facts about myself. I don't like wet food and will eat only dry. Mum worries about me and has tried everything to get me to eat wet. I don't like it because I don't like to get my whiskers dirty. Because I don't eat normal wet cat food (though I used to eat the kitten variety when I was little because I was so starving when I got here), Mum calls me a vegetarian cat. Of course she knows that cats can't be veggie because it is harmful to our health, but she calls me that anyway. She would never feed me a vegetarian diet. She wants me to eat meat, even though she doesn't any more. I love cat grass (again, why my mum calls me veggie). It makes me feel so good! I don't care for catnip, though. I don't like to be away from my mum for long and hate being left alone in the house. This happens very rarely though. I don't want another cat living with us and hope Mum doesn't ever adopt another one. I want her all to myself. I'm sorry for the other kitties, but my mum is my mum and no one else's. I do try to help other kitties though by helping them find forever homes through my twitter and facebook, and this blog of course. I gave my mum the idea of writing my story in A Forever Home For Athena so we can help raise awareness and funds for animal rescue. I like nothing better than to nap with my mum in the afternoons and sleep on her bed all night. It's my most favourite thing of all! Luved readin more bout ya! Feel free to send dat unwanted wet foodz my way, ok? Concatulations on your award, Athena! I loved reading all these facts about you! Concats on the award, Athena! It's perfectly fine to be a one-cat only household -- lots of kitties need to be the only cat. Just as an FYI, not as a specific suggestion to you: Derry was a HUGE kibblehead, but because of his cystitis, our human transitioned him onto canned by sprinkling a bit of FortiFlora (tasty probiotic) on the canned. He and Nicki both eat mostly wet now, though Derry is particularly fussy and will eat only a couple of different kinds. They each get 1TBSP of kibble twice a day though, for a treat--they still go crazy for dry food. LOL. Ha ha... none left as my mum gave it to other kitty friends. Thank you, Sparkle. Glad you enjoyed reading about me. Yes, I have my mum under the paw, all right! Athena does drink a lot of water and I make sure I play with her to get enough exercise. Thank you for the link!